Taking place at the historic Blossoming Pillars Stadium (Jūhi Dōhyō), the final rounds of the Exams forego the tricks and surprises of earlier, making way for an arena that is both iconic and neutral. 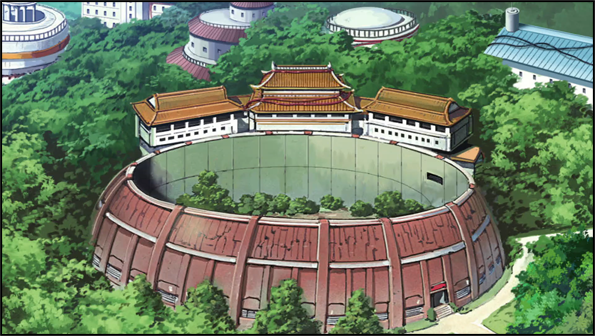 In spite of a modest 25m radius, this arena is no less grand than those which preceded it, boasting stands that raise high above for observers to watch the anticipated final matches and a fighting zone where legendary heroes and Kage once fought. A dusty circle surrounded by sparse shrubs and a high wall encloses combatants, who enter from opposite ends of the arena, the crowd roars, the Chūnin Exams draw to a close. Bau would huff idly as he was being pampered now before his match. Up until now he was just a hobo that was being paid to fight but he had actually made it fairly far. Though it was mostly due to his difference in experience and raw physical power. He wasn't out to kill or maim though like the rest of these kids. His emerald green eyes would glance down to his hands as they held his walking stick. The med nin here had done a great job removing the first degree burns from him. He had even been given a change of fresh clothes that matched his old ones. However they still smelled like they were freshly purchased. It wasn't like him. He liked his old wrinkly clothes. He was accustomed to them. These ones just seemed stiff. Still His long green robes with white patterns was still hanging on his shoulders. His clothing was a crisp and clean but still a pair of baggy green shirt and pants. Even the sword on his hip was old and worn. Sealed away either by time or on purpose. It would take a feat of strength to draw it an even then it would barely be of any use. His wooden sandals rested in the strong soil. Stiff under his feet as emerald eyes peered out from behind a green and white striped hat and long white hair. They had made sure he had water to drink and food to eat while he waited of course. They wanted him fully refreshed for his fight. Still he had been escorted out of a pair of double doors into an arena barely lined with sparse shrubbery. If the other matches had a theme this one was very plain in comparison. No trick to getting by here. Just flat open ground with no where to hide between him and his opponent. He would stop just on his side of the arena and let the doors close behind him. Plenty of booing in his direction of course from well above. He wasn't a crowd favorite. Hunched over to keep his fearsome size from being so obvious. He would lean his stick up against his shoulder and pull out a wooden pipe packed with green herb. Lighting a match as he began to smoke the sweet smelling herb. 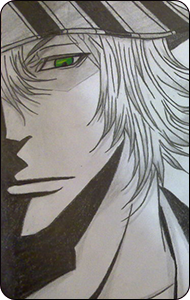 His emerald eyes looking passed the thin smoke as he looked for his opponent. The last match had been more promising. An arena littered with weapons like a battlefield of old. He would puff on his pipe a moment as he thought about it. The last time the kid didn't even show up. He was still getting paid either way but it had been a bit of a let down. He wondered what this kid would be like. The others had made mistakes due to inexperience but even then he had grown overconfident and fallen into a technical loss before. This arena hadn't told of any special rules though. Just a straight forward fight likely. Bau was built for that but at the same time...he would shrug off his cloak and toss it to a small bush to his right after focusing five chakra into it. Welp, likely this kid would spit fire at him too. These kids needed a tic tac. He would at least pretend to be prepared. Kashiki stepped through the door of the arena. Unlike the previous arenas this one was smaller and didn't seem to have any special gimmick like the extreme darkness from his first fight. The sunlight's golden rays streamed down through the clouds, gleaming ever so slightly off of his painted samurai-like armor. Boos and shouts filled the arena and at first Kashiki thought they were directed at him. His last match hadn't been quite a spectacle, his opponent failing to react to a measly metsubushi before being sliced to bits. Of course, Kashiki was wrong in this assumption, the boos were directed towards his opponent who seemed to have made his way into the arena before the boy had. Standing on the other side of the arena was a man. The first thing that came to Kashiki's attention was his age, his previous opponents all seemed to be recent graduates but this man seemed to be an adult, not old but definitely not in his teens. It didn't help that he had long white hair and a walking stick he was hunched over. A rusty blade hung from his side, a fellow swordsman it seemed? Well, there was no reason to waste time. Kashiki pulled off his poncho and tossed it to the side while channeling chakra into it. His hand dropped to the hilt of blade that rested on the small of his back and pulled it free, readying it for use but only keeping one hand on it. His other hand dropped into his pouch, ready to grab any of his other gear if need be. He gazed across the arena, his eyes meeting his opponent's through the smoke of the man's pipe. It was clear that he would await his opponent's move. Bau would take another puff of his pipe as he looked the other kid over. A swordsman eh? Well this was direct and refreshing. Decent form with a sword at least. He could hand it to them, they trained hard for this. Some of them perhaps their entire lives. He wondered though what they knew of war. What this one knew about using that blade when it was life or death. The weight of it in his hands and how prepared he was to use it at its designed capabilities. One shouldn't draw a sword without being prepared to cut down their enemy. It was the law of war. For some they might hesitate seeing a sword drawn. Knowing it could end them and changing how they fought. However for Bau he was familiar with blades being drawn against him. Familiar with defending against them and using them. A glance down at his own rusted blade held his attention a moment. The kid was a good twenty meters away so he felt comfortable glancing down at it. That blade of his still held weight for him. More a reminder than anything else. A reminder of the weight should he become the man he used to be again. He would puff the last of his bowl a moment. Having stood there as the boy waited for him for half a minute with nothing. The crowd had grown quiet to a murmur now. Wondering if either combatant would make their move or if each were just going to stare each other down. These were the finals after all. Neither had made it here from brash decision making. It was a test of skill at this point with each contestant being about equal to the next. This match up in particular was designed to pit the two against each other with similar skill sets it would seem. Still Bau would sigh before tapping his pipe against his wrist knocking the ashes out of it and pocketing it again. If the boy was going to have Bau come to him then so be it. He would dance along to this kids beat and test him. See how this particular skill set played out against his own and which would come out on top. Those emerald eyes searched out the eyes of his opponent. Like stones staring into his soul. An experienced warrior against a trained young man. What a match up. The whispers stopped the moment Bau began to limp towards the young man. Leaning on the stick heavily as if needing it just to cross the distance. Careful to time his limp with his walking stick to give a sense of practice to it. Like he had been crippled for some time. He would limp across the way under the silence of the arena for a moment. Confusion clear in the stands. Why was some old crippled hobo fighting a trained ninja? What possible reason would there be for the proctors to allow the old man to fight? Still hunched over he would cross the distance to the waiting boy. However there was one advantage he did have. At the last moment Bau would shift forward with surprisingly fast movement for a man his size. Now much closer as he shifted from being hunched over to standing tall it was clear that Bau was a big man. Not the largest in the land but his sheer strength was obvious. And with his size came reach. Not to mention with a staff over a sword. From outside a couple of steps reach of the boys sword his staff suddenly shifted the bottom end into a low sweep for the boys left knee. A low attack for practitioners of the blade was usually one of the more difficult things to continue defending against and attack. So he was dealing with someone with a greater reach than he had with a weapon easily designed for shifting attack ranges. What was more, he was fast. Easily as fast as the boy. His opponent took another puff of his pipe, then another. Half a minute had passed and neither had done anything but ready themselves for their opponent. Eventually, the boos from the audience lowered to a dull murmur then a while later broke into complete silence as his opponent moved towards him. The man trudged along, stumbling with his walking stick. 'He's either badly crippled or a good actor' Kashiki thought to himself as he placed the blade back in its scabbard. His hands wove into a few hand seals preforming the Lesser Hellfire Cloak technique. As his opponent entered ten meters he would throw a metsubushi at him, a trick that had made him a bit of a crowd favorite in his last match. While last time wasn't a good because of it being an even match, it was however, fun to watch due to the one-sidedness of the match. Hopefully the fact that his opponent seemed to be crippled would allow his metsubushi to land and give Kashiki an easy win. After throwing the metsubushi he would once again draw his blade, not a moment to soon as his opponent gained sudden speed and surprisingly, quite a bit of height. The man would dash forwards and bring his staff forwards in a low attack. The staff had just the tiniest bit of range on his own blade, but that didn't matter as Kashiki dashed forwards when his opponent dashed, closing the distance and getting within striking range as his opponent made his attack. The staff would collide with his fiery armor and do nothing as Kashiki would swing his own weapon aimed for his opponent's chest, should the blade strike he would use his Lesser Demon Claw technique to add a bit more hurt to the attack. After the exchange of attacks he would make a burst of movement backwards before performing the Still Wind Cloaking technique and dashing out to his left side in a bit of a flank. Hopefully his opponent would be bewildered by his sudden disappearance aswell as his immunity to his opponent's attack which would grant him an upper hand in the rest of the fight. Description: Still Wind Cloaking This jutsu is used to hide the user allowing for escape but also improved combat capabilities. 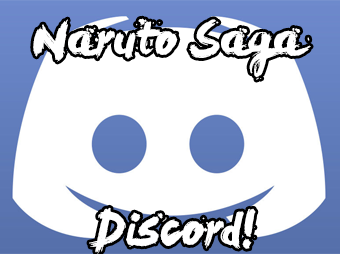 The user channels minuscule amounts of futon and katon chakra into the air, causing the user to appear invisible as the chakra disrupts the air around them hiding them. Additionally the moving wind distorts sound waves, blocking them from discovering the user of this jutsu unless they rank of the sensory jutsu using sound wave based detection is c rank or higher. The katon chakra also causes a blur around the effect causing it to blend better, however the blur is easily noticeable by those with perception of C-0 rank and up (this sees through the entire stealth jutsu, not just the blur. If someone has c-0 rank perception this jutsu has no effect on them). Description:Lesser Demon Claw/ The user forces futon chakra into the around them and their weapons. Then they control the chakra to rub against each other at extreme speeds causing five 1 inch cuts whenever the user lands a physical attack. Bau would use hit momentum to shift around the cloud aimed loosely for his face. An interesting tactic he thought to himself as he shifted passed the cloud with little mind for it. The tiny ball not packing enough to spread too much more than a direct hit aimed at the eyes. If one simply didn't let it hit their face it was fine. The scent of it still sitting in the air. However he wouldn't say it was the first time someone attempted to blind him in a fight. Not an honorable thing to do but he didn't mind. This was combat after all. Still the opponent would activate a technique of some interest. Shifting a cloak of red energy around himself. Another full body technique? His last real fight had one of those but it hadn't helped him much. Bau would still close the distance as his opponent did too though. They were similar in running speed it seemed. However the boy made no move to defend himself from the B rank blow. Already Bau could see this wasn't going to do himself any good. It was human instinct to avoid blows. For a fighter, not avoiding a blow to a key point in their leg meant one thing, they knew it wasn't going to effect them. Bau shifted mid step into his attack. He needed to test something. The sword was thrust forward towards his chest and he could only shift his stick enough to slide the cut as he turned his body into something shallow. However something else made it an inch deeper across his chest. What would have been a tiny scratch was now a decent gash. Not enough to cause heavy bleeding but certainly first blood. However even as the boy moved his blade it went from one cut to five like a claw attack. Shallow but had Bau been able to feel it certainly painful. However he was still stepping forward as the young man shifted from a charge to launch himself back. In that moment that it took to shift his footing when Bau didn't have to he was on top of him. His left hand reached out to grab the hand holding the katana at the top and as the kid tried to shift to back peddle Bau would shove the end of his stick between the young mans legs and shoulder check him while shifting the stick behind the boys right knee. The point was physics. He had a heavy weight pushing into him without his footing being set solid on the ground. He had positioned himself to retreat instead which meant his footing was lighter. The stick would throw off his balance as It was behind the knee if it connected and with luck bring him to the ground. However Bau would notice as he held the boy tight that his fearsome visage and his gear would fade from sight. As if by magic the young man he still had a grip on would turn invisible. If he lost that grip he would be in trouble. Either way he would try and follow the boy down if he dropped him. Invisible or no he knew the arm was connected to the young man. His right knee would shift behind the stick as he went down with him. Hoping to use it to further pin him to the ground with the stick held down with all of Bau's weight on him. Man this sure was troublesome. Far as he could tell though his clothes weren't lighting on fire though. Blood from his chest would drip down if they made it to the ground and fade away into the jutsu. Truly an impressive technique. Bau has ceded the match. Kashiki advances.